Thursday Drink Night (TDN) at the Mixoloseum is becoming a favorite part of my week. I’m especially looking forward to the upcoming TDN (November 20), when the event is being sponsored by Leblon Cachaça. We will be joined by Leblon representatives, whom we can bombard with questions about their product, and Brazil’s unique liquor in general. Cachaça is a distillate of sugar cane juice. While classified more generally as a rum, it is different than most rums, which are usually distilled from molasses. Leblon is produced at the Maison Leblon in Patos de Minas, Minas Gerais, by Master Distiller Gilles Merlet, a native of Cognac, France. Leblon says the special microclimate and high altitude results in taller and juicer sugar cane, which is hand harvested and pressed in less than three hours. After a 15 hour fermentation using proprietary yeasts, the must is allowed to decant, and is then distilled in small batches in artisanal copper alambique pot stills. The cachaça is then aged for up to 6 months in vintage XO Cognac casks, blended, and triple filtered before bottling in wine bottles. The result is a very accessible cachaça. The nose is very fresh and fragant, less aggessively grassy than other cachaças I’ve tried. The smoothness of the nose belies the power of this 80 proof liquor. There is a bit of a burn on the tongue and even in the throat, which is not too surprising given it’s only aged about six months. But as usual, I’m not looking to sip this straight, I want to mix with it. I’m saving my ideas for new drinks for TDN, but in the meantime, I had to make a caipirinha. Given it’s the time of year where I’m starting to go to work and return home in the dark, this sunshine in a glass is a welcome respite. muddle the lime and simple syrup in a rocks glass. fill glass with ice, pour in cachaça, and give a good stir. I like using either simple syrup or superfine sugar in my caipirnihas. Regular grained sugar doesn’t fully dissolve and leaves an unpleasant gritty feeling. Adjust the sugar to your personal taste. On occasion, I like to add soda water as well to lengthen the drink. 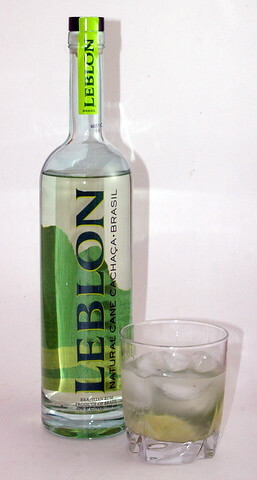 Leblon is excellent in a caipirinha, and I’m looking foward to seeing what new drinks we can invent using it. Pick up a bottle and join us this TDN!